The MBM HDP0102 Destroyit Degausser/HDP saves time and money. 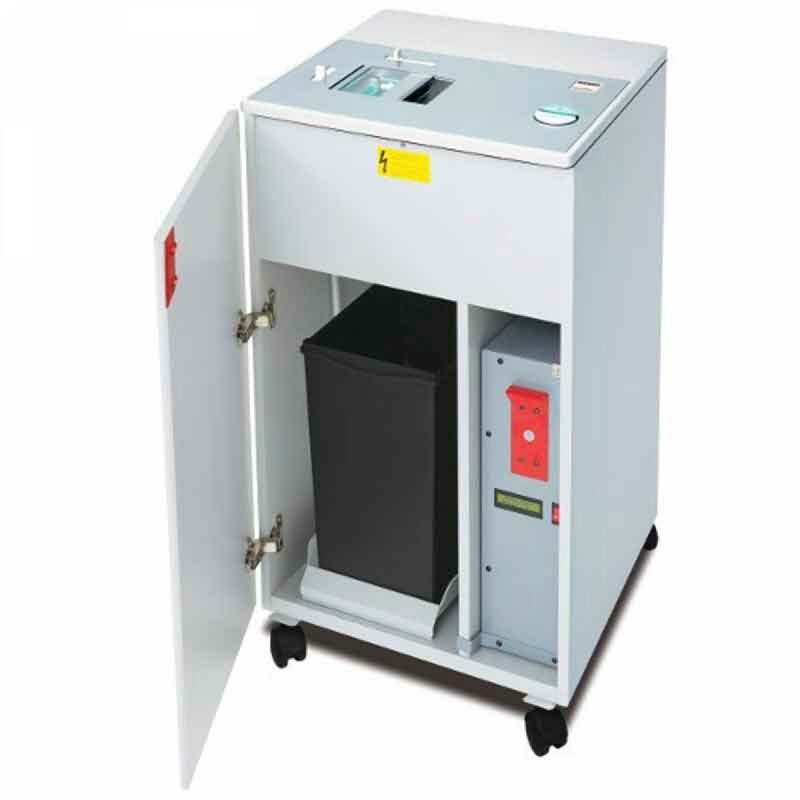 Comprehensive SPS safety package (HDP unit) : Easy Switch control element uses illuminated color codes and symbols to indicate operational status and functions as an emergency stop switch; electronically controlled, transparent safety shield in the feed opening; automatic stop after punching; automatic power cut-off when cabinet is opened or collection bin is full; double protection against overheating. HDP unit: Punches a hole completely through the hard drive, making it unreadable. Suitable for 2 12 and 3 12 inch drives (single feed). Handy slide lever for easy selection of hard drive size. Adjustable feed chute made of high quality steel. LEDs illuminate feed chute during punching process. Punching die made of hardened, nickel-plated steel. Automatic reverse on punching die prevents jams. Slider mechanism for unloading punching compartment destroyed drives drop into a sturdy collection bin to await proper disposal. Quiet and powerful single phase motor rated for continuous operation. Sturdy Twin Drive System with fully enclosed gear box housing. 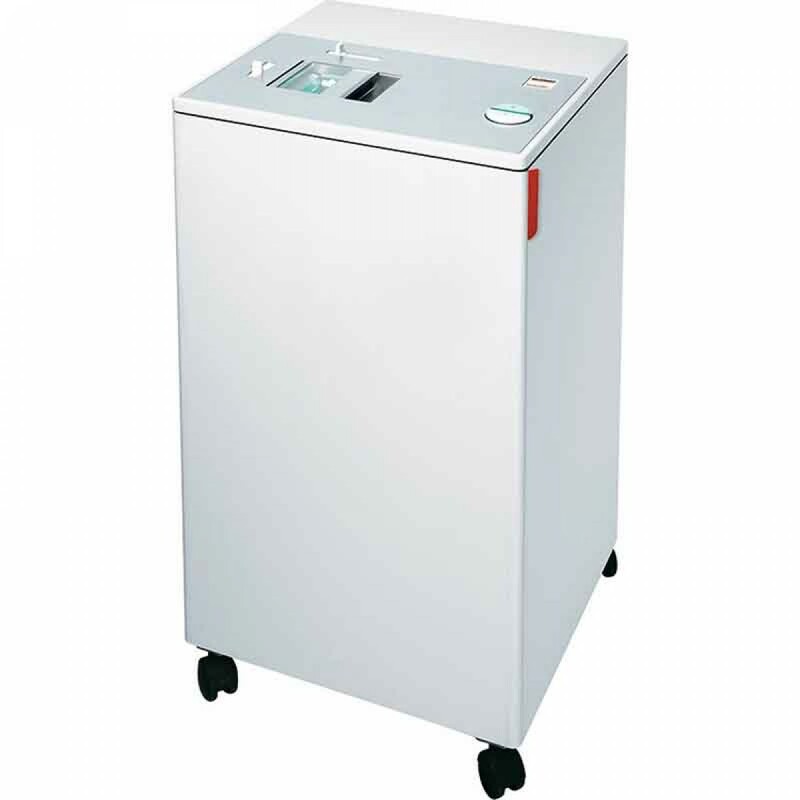 Degausser unit: Erases hard drives (laptop, desktop, and network up to 1 12 inches high) and high coercivity tape media, including all formats of LTO, Super DLT I and II, AIT, 3590 Series, 8 mm and more. Fast, 60 second cycle time. High field strength and encompassing magnetic field ensure data is completely erased and non-recoverable, regardless of operating system or interface. Digital status indicator and field strength verification. No moving parts allow for extremely quiet operation. Rated for continuous operation (no cooling necessary). High quality wooden cabinet mounted on casters. Anti-static collection bin made of impact-resistant plastic. 1 year warranty on all parts, excluding wearables. Hard drive sizes 2 1/2" or 3 1/2"